Halve avocado, remove the pit, and dice. Halve the red onion and slice thinly. Add both to a serving bowl along with the spinach leaves and crumble in the feta. Add half of the blueberries and all of the water and honey to a pot. Let simmer for approx. 5 min. Remove from heat and let cool slightly. Pour the blueberry mixture into a food processor. Add mustard, balsamic vinegar, and part of the olive oil. Blend into a smooth dressing and season with salt and pepper. Toast sliced almonds in a frying pan over medium heat for approx. 3 min or until golden. Remove from heat and set aside. Season chicken breast with salt and pepper, heat remaining olive oil in the same pan used to toast the almonds, and fry chicken for approx. 4 min. on either side until cooked through. Remove from heat, let rest briefly, then slice or pull apart into strips. Add chicken, almonds, and the rest of the blueberries to the bowl with the rest of the salad. 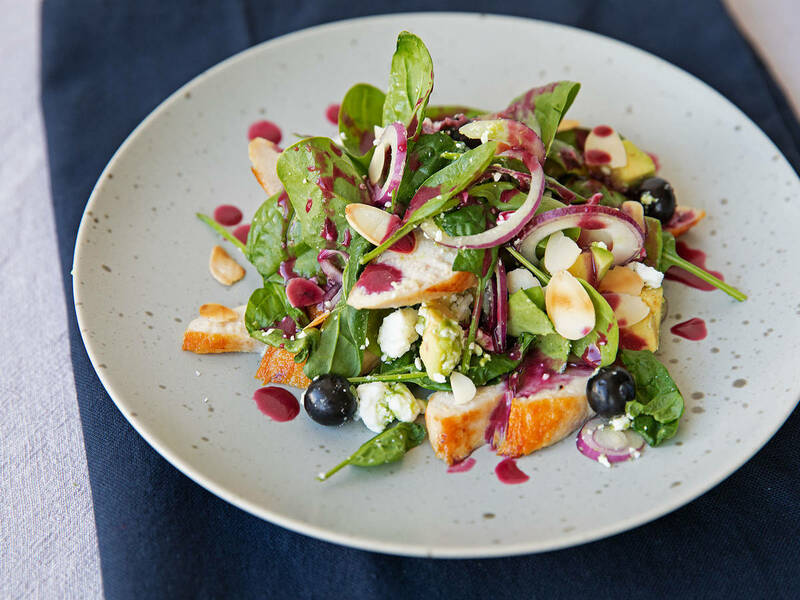 Toss with the blueberry dressing and enjoy!